The French study also indicated a possible higher risk among people who used pesticides on houseplants. All agricultural workers exposed to pesticides had a slightly elevated brain tumour risk, it suggested. But the Occupational and Environmental Medicine study found the risk was more than doubled for those exposed to the highest levels. The risk of a type of central nervous system tumour known as a glioma was particularly heightened among this group - more than three times the risk in the general population. Gliomas are more common in men than women, and the researchers speculate that part of the reason might be that men are more often exposed to pesticides. However, the overall risk of developing a brain tumour remained very low. UK experts said the findings were inconclusive. The findings were based on an analysis of 221 cases of brain tumours by the French Institute of Public Health, Epidemiology and Development. 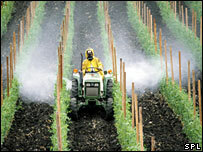 The research took place in the Bordeaux wine-growing region, where 80% of all pesticides used are fungicides. The chemicals are mixed and sprayed in a mist to protect vines from fungal attack. However, the researchers were unable to get specific enough data to pin down exactly which types of pesticide were associated with the development of brain tumours. They also found that the use of pesticides indoors for house plants seemed to be associated with a more than two-fold increase in the risk of brain tumour. But they admitted further work would be needed to confirm this association - again because of a lack of detail about which pesticides were used in enclosed home environments. Josephine Querido, science information officer at Cancer Research UK, said: "More research is needed to confirm the observations made in this study as the results were based on people's recollection of pesticide exposure. "Brain tumours are relatively rare and, although workers exposed to high levels of pesticides in industry or farming may be at higher risk of certain cancers, current evidence is inconclusive and any risks are likely to be very small." Kathy Oliver, secretary of the International Brain Tumour Alliance, said: "Our organisation maintains contact with the world's leading specialists in brain tumours and unfortunately no single cause has yet been identified. "The French study has identified an area warranting further investigation, however, we caution that the results should not be exaggerated. "It is important to emphasise that more research is required before people start throwing out their cans of household pesticides." A spokesman for the Crop Protection Association said: "Pesticides are some of the most thoroughly regulated chemicals in the world. "There is no conclusive scientific evidence of a link between pesticides and brain tumours. "This type of study does not demonstrate cause and effect, and the authors themselves admit that they did not identify which pesticides were used or the levels of exposure." Pesticide exposure was linked to a raised risk of Parkinson's disease in a study published last month.